Secrets abound on the island nation of Godewyne. The fact that defenses are week at the King's seat, Castle Godewyne, is not a secret to power hungry noble Aderlard Maculinus; nor to court jester Josh who seems to be closely guarding a few secrets of his own. Speaking of secrets, what is the hidden agenda of the royal assassin and what is Wickenshire's blacksmith, Ranulf hiding about his past? How will Ranulf's secrets affect his orphaned grandson/apprentice Rollie? Will these and other secrets be revealed or pushed into the shadows with the arrival of a mysterious stranger who wants to commission Rollie to forge and odd Druid token out of a mysterious metal? An once the secret of the token is revealed, will anything ever be the same? Fraser Scott is a talented story teller. This was a highly entertaining read with compelling characters that drew me into the story. 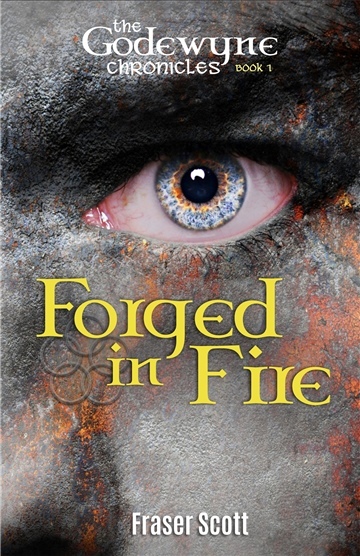 This debut novel from Fraser Scott, "Forged in Fire" is a new addition to the great Fantasy tradition of Jeff Wheeler, James Maxwell, and David Eddings and is the first book in The Godewyne Chronicles books series: 1. Forged in Fire, Book 2: A Song Among the Trees, & Book 3: Rollie Revealed.